When it comes to wedding day fashion for the groom & groomsmen, there are SO MANY OPTIONS for wedding day attire that go way beyond the traditional tuxedo. 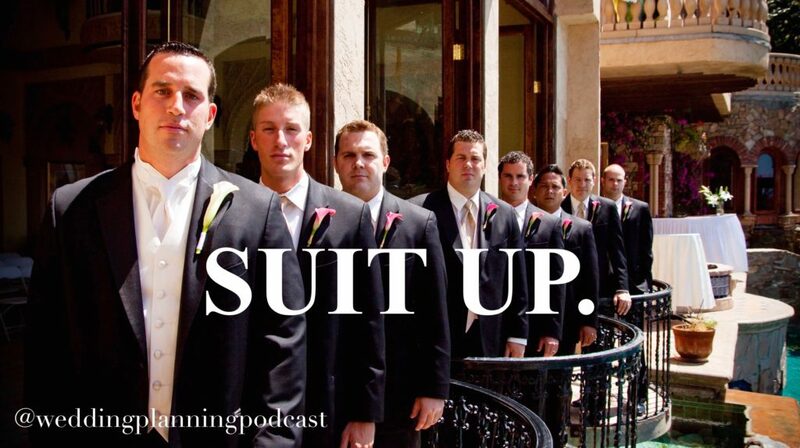 On today’s show, we’re reviewing everything you need to know about tuxedos, suits & casual wear options for the wedding day. When I got married back in 2010, tuxedos were the standard fare. Sure, you’d see the occasional light colored suit, or mismatched groomsmen, or funky socks, but mostly things were pretty buttoned up & formal. Weddings have trended towards more relaxed & casual over the past few years. Our most formal option for the groom & groomsmen is the good old tuxedo. You can buy a tuxedo (expensive), or go the more standard route & rent one for the wedding weekend. First do a quick google search for formalwear rental places in your area. Make some quick phone call to price compare. Next, using that info, narrow your list down to one of two that fit your price criteria and make an appointment. Try your very best to go on a weekday, when it will be much less crowded & stressful. A BONUS to weekday appointments is that you’ll get much more attention and service from the staff! Understand that there will be multiple options available. A salesperson may try to automatically steer you towards higher priced styles and a bunch of up-sells. If you’re not satisfied with the price range, explain very firmly what your budget is. Ask to see options that would fall into that price point. Repeat the steps above and browse as many places as necessary to find exactly what you’re looking for. The process for how your wedding party members can submit their measurements. I LOVE the custom suit option for the groom. A custom suit is much less expensive than outright buying a tuxedo. Bonus, in most cases it’s something you’re more likely to wear again / regularly, making this a really practical option. Buying a suit “off the rack” is an option, and will take less time than a custom suit. You’ll want to shop around to find a style and price point you love. You may be surprised at the price differential between an off-the-rack suit, and a custom suit – more on this in the next point. HOW LONG DOES A CUSTOM SUIT TAKE? A custom suit will take anywhere from 1 – 5 months, which is a very general guideline. Visiting various stores and asking a bunch of questions is the best way to get a more definitive timeframe. You may hear the word CUSTOM and automatically assume it’s much more expensive than off-the-rack. With wedding dresses, this is definitely the case, but not necessarily true with suits! My favorite custom suit option? Visit www.indochino.com and get a premium, custom suit for just $379 with promo code “PLANNING”. Maybe tuxedos & suits feel a little bit too formal for the wedding vibe you’re going for. Last but not least, let’s explore a more casual option. Take the opportunity to use your wedding accent colors in your accessories for a really fun, visual cohesion across the entire wedding party. Weddings are much less formal today than in years past, and this is a great option for max fun & affordability! Q. Where are some great affordable places to get men’s wear? The grooms will just be in pants, white button up, suspenders and bow ties. A. Pants & shirts can be a good deal at any department store or retailer if you’re shopping sales & coupons. Give each guy some general guidelines about color & style, and let them pick up their own pants & shirt. For the suspenders and bow ties, I LOVE Etsy.com. You’ll find really fun & personalized accessories, available in any colors imaginable. CLICK HERE to join Kara & Lauren & dish about all things weddings on episode 23 of The Target Girl! A. Before you have a heart attack over adding 8 tuxedo rentals to your wedding budget, take a deep breath, because I have good news. You are not automatically responsible for covering this expense for your wedding party. To start, if the rental costs are something that you have the means to cover, that is by all means generous and your wedding party will be very appreciative. If this is NOT something that’s in your budget, it’s perfectly normal and acceptable (and very common) to have your wedding party members each pay for their own attire, whether renting or buying. Regardless of what you choose, it is required, and I stand by this point firmly, that you discuss any financial responsibilities before asking them to commit to the duty. It’s just not fair to spring a $500 expense on them just months before the wedding, without discussing that way back when you asked them to be a part of your wedding. Lastly, to wrap up today’s show, we’ve been having a blast on Instagram – I LOVE hearing your questions and stories about your wedding plans!